This conflict is also what springs Starbuck back into action, and it’s telling how she views it with a “you’re either with us or against us” mentality. It’s the kind of mindset that’s easiest for her to deal with, and it’s like a shock to the system to wake her up from the funk she’s been in; she’s living NOW, not in the past, and trying to figure out who she is is a lost cause at this point. Adama, on the other hand, is going to go down fighting as well, but is going to do so abiding by his own principles. And so, he doesn’t leave with Roslin, instead staying behind with Tigh to take down as many people on the way out. It’s quite possibly the most badass image I’ve seen from the show. Angry Roslin definitely compares in terms of badassery. Also, these last two episodes have really made me excited about the end of the series, as there seems to be both an air of finality and a sense that there’s no turning back anymore. Gaeta and Zarek have been executed, but although Adama and Roslin have control of the ship once again, there’s no telling just how fractured these people are now. In the end, the two leaders of the mutiny share a smile with each other, accepting their fates as they face a firing squad head on, and “It stopped” is one of the most hard-hitting sentences ever uttered in the show. 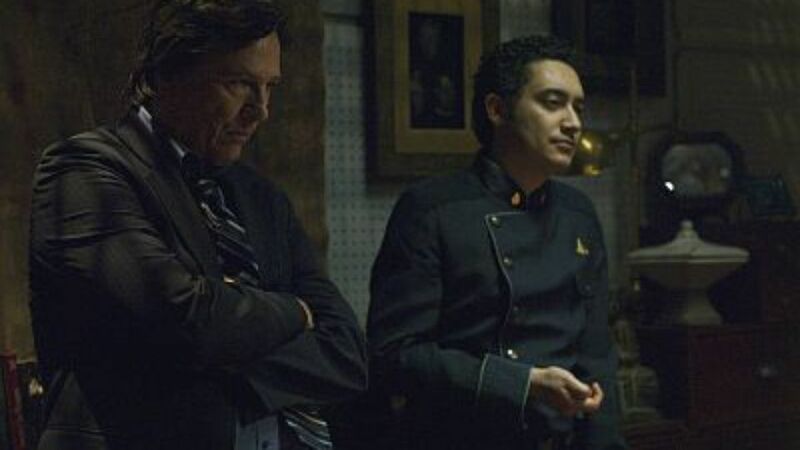 Add that onto the Gaeta- Baltar coffee conversation earlier, and you have an amazing ending to a character who’s been more of a background guy throughout the series. And speaking of minor characters, Kelly’s even more minor than Gaeta is, but his scene with Tyrol does a good job of encapsulating the fleet’s situation: it “used to be a hell of a ship”, but things are crumbling down around them. In fact, the ship itself is actually beginning to crumble! This is definitely something that’s going to play a role in the final five episodes of the series, but before get to that, we have to get through an info dump that pretty much goes all out in terms of info dumping. To be honest, I’m not a fan of the way the episode is structured–particularly the Anders set up–and I wonder why this information couldn’t have been gradually doled out in smaller increments. Nevertheless, it’s still a very important episode in terms of the show’s mythology, and the Cavill-Ellen dynamic is well handled by Vernon and Stockwell. Their discussions cover anything ranging from humanity’s worth to justice to culpability for their current situations, and while these aren’t the most elegant discussions the writers have written, they help keep the growing heap of info pretty intriguing. I was advised to watch this immediately following episode fifteen, and I’m glad I did. I’d rather the upcoming series finale serve as the final note of the swan song, as this particular television movie just fills in a few blanks concerning events we’ve seen before. It features some excellent performances by Grace Park and Dean Stockton, but as a whole, it admittedly underwhelms. As you can see, I don’t have much to say about it.